For almost a decade now the Gaza Strip has been cut of from the rest of Palestine and has suffred from an illegal and inhumane blockade and occupation. With approximately 1.8 million people living on only 360 km² of land, the Strip is one of the most densely populated areas of the world, and the Israeli imposed siege has turned the area into a large, overcrowded, open-air prison. In the summer of 2014, the Israeli military launched an offnsive codenamed “Protective Edge” against the Gaza Strip. This was the most brutal Israeli aggression since 1967.
children. Among the statistics from the Summer of 2014, one fiure is particularly shocking: 142 families lost three members or more. Whole families were wiped out, sometimes losing members from three generations – grandparents, children and grandchildren. Europe, which is Israel’s main commercial partner, along with the US, Israel would not be able continue its policies of occupation and colonization. Israel’s impunity must end. 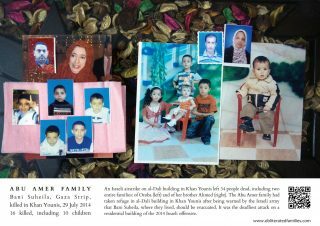 The exhibition in Amsterdam is organized by the Dutch coalition for Palestinian children in Israeli detention.